LIVE Holiday covers at least one lesson for every month, your calendar needs will be covered. capture your students’ attention all year long! Looking for creative, holiday-focused ways to capture your students' attention all year long? Your wish is our command: We're proud to unveil LIVE Holiday, part of our dynamic LIVE Curriculum line of resources. With at least one lesson for every month, your calendar needs will be covered. Plus, LIVE Holiday includes access to the innovative new LIVE Daily app that sends teenagers "in the moment" prompts and ideas for living out their faith. Each day's idea taps into different ways that people learn — through serving others, reading Scripture, tackling questions, looking toward Jesus, and worshipping in ways beyond singing songs. Make the holidays a memorable highlight for your students, while helping them discover how the Bible remains relevant to their lives—every day of every month, throughout the year! Save Time: Meaningful, relevant material will always be right at your fingertips. Maximize Impact: Use special days and seasons to draw students to Jesus and to his plan for their lives. Mark Oestreicher (Marko) is a veteran youth worker and founding partner in The Youth Cartel, providing resources, training and coaching for church youth workers. The author of dozens of books, including Youth Ministry 3.0, and the new release Hopecasting: Finding, Keeping and Sharing the Things Unseen, Marko is a sought after speaker, writer and consultant. Marko lives in San Diego with his wife Jeannie and young adult and teenage children, Riley and Max. Marko’s blog: www.whyismarko.com. Looking for creative, holiday-focused ways to capture your students’ attention all year long? Your wish is our command: We’re proud to unveil LIVE Holiday, part of our dynamic LIVE Curriculum line of resources. With at least one lesson for every month, your calendar needs will be covered. Plus, LIVE Holiday includes access to the innovative new LIVE Daily app that sends teenagers “in the moment” prompts and ideas for living out their faith. Each day’s idea taps into different ways that people learn — through serving others, reading Scripture, tackling questions, looking toward Jesus, and worshipping in ways beyond singing songs. This exciting 18 lesson volume features fun, exciting lessons to teach important truths throughout the year. 3 weeks of Easter, 2 weeks of Thanksgiving, 2 weeks of Christmas, 11 single-day holidays by Simply Youth Ministry. 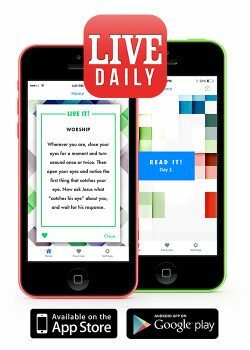 LIVE Holiday includes access to the innovative new LIVE Daily app that sends “in the moment” prompts and ideas for living out their faith. Each day’s idea taps into different ways that people learn—through serving others, reading Scripture, tackling questions, looking toward Jesus, and worshipping in ways beyond singing songs.